The Wilson 1000 Trunk Lip Mount CB Antenna has been designed to be the most powerful base loaded CB antenna in its class. The trunk lip mount of this Wilson 1000 is a convenient way to achieve competent ground plane for the antenna while the 62 1/2 Inch whip offers plenty of practical transmitting range. The Wilson 1000 is rated for up to 3000 watts which is compatible with today's high powered mobile transceivers. The antenna coil is constructed from space age high impact Mobay Thermoplastic, a practically indestructible compound well suit to high stress and heat environments. 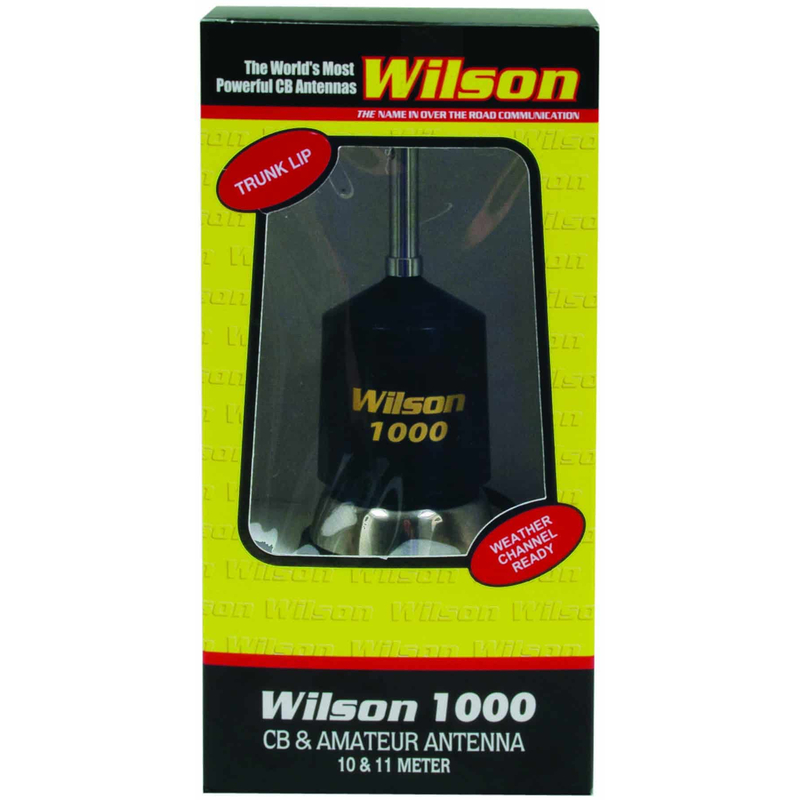 Wilson CB antennas utilize 10 gauge copper wire with silver plating for enhanced power and antenna performance that beats other manufacturers hands down. Independent laboratory testing at Lockheed Corporation's Rye Canyon Laboratory and Antenna test range proved that Wilson 1000 has 58% more gain than the closest competitor's CB antenna. Wilson 1000 antennas are ready to install right out of the box on the lip of your trunk lid or similar vehicle surface. The Wilson 1000 CB antenna is simple to tune over both 11 meter Citizens Band radio networks and 10 meter amateur radio bands. Wilson antennas have been trusted for over 45 years by over the road professional who depend on their communications gear for livelihood, safety, and social networking. 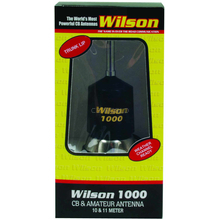 You'll be more than satisfied with a Wilson 1000 CB antenna from CB World, your #1 shop for CB radios and CB antennas! Compatible with CB, 10 Meter amateur, and professional radios operating in the 26 to 30 MHz bands. The Wilson 1000 includes a high quality, low loss 17 ' RG8X coax with a soldered PL259 connector. The antenna is ready to install and tune right out of the box. An extra PL259 connector is included loose in the box for custom cable routing in tighter spaces. Tuning the Wilson 1000 is similar to any other stainless whip antenna and requires a quality SWR meter and 3 foot jumper cable. 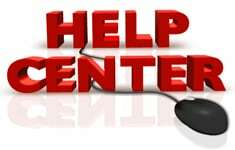 Complete antenna tuning instructions are available at the CB World help center.